At the Carmelite Provincial Chapter of 1999, the Province decided to establish a mission in Uganda. The first two missionaries, including Fr. David Costello, O.C.D., were sent out to begin the process and, in October of 2002, the Carmelite presence was established in St. Kizito Parish Kyengeza in the Kiyinda-Mityana Diocese. Then, in 2008, it was decided that instead of working in a parish, the focus would be on educating seminarians. So, in that same year of 2008, the Carmelites left St. Kizito and built a Philosophy House of Studies in Jinja, Uganda, East Africa, where the Carmelites continue working to this day (photo above is of the House of Studies in Jinja). Uganda is a country about the size of the State of Oregon. It is situated in East Africa and has a population of 21 Million. A good 85% of the population is Christian, and 40-45% of these are Catholic. It is estimated that there are 4,000 Religious, including a number of prospering native congregations. One of the 18 Dioceses within the country is Kiyinda, Mityana, where St. Kizito Kyengeza Catholic Parish is located. Mityana is about 50 miles west of the Capital, and it’s just 15 miles from Mityana to the Carmelite Mission at Kyengeza. When the Carmelites were originally invited to make a foundation in Uganda, the Diocese of Mityana had 21 parishes. Two of these parishes were staffed by the White Fathers and the Capuchins, and the rest by Diocesan Clergy. There are 72 Diocesan Priests and 530 Catechists, as well as the usual array of Diocesan organizations: Priests' Senates, Parish Councils, Educational Institutions, Social Services and Justice Departments, Legion of Mary groups, and Small Christian Communities. There are neither permanent Deacons nor Lay Eucharistic Ministers. The desire to have the Carmelites make a foundation stems from the appreciation of the Charisms of the more ancient and traditional religious orders in the Church. Another important factor is the existence of a Convent of Discalced Carmelite Nuns in Mityana. Their Monastery is part of the Diocesan complex, which includes a modern Cathedral, various Diocesan Offices and residences, as well as a Catechetical Training Center. It is the site where three of the 22 Ugandan Martyrs were killed (Luka, Noa, and Matia). In Jinja, a city East of Kampala and about a two-and-a-half-hour drive from Mityana, there is an Intercongregational Philosophy Seminary. It is owned and operated by four founding congregations: The White Fathers, The Comboni, Holy Cross, and Mill Hill Fathers; each has its own Formation House, but the academic effort is in common. Future Carmelite Students would be able to study at this Seminary. In 1942-43, Fr. Karooli, a native Ugandan Missionary of Africa priest (White Fathers) offered Fr. Patrick Perjes, OCD (who later became a member of our California-Arizona Province) some land to build a Carmelite Monastery for the Friars. Fr. Patrick was a prisoner of war, waiting for release and return to Europe, and so could not do anything about it. He recounts this incident in his memoirs. Fr. Patrick died in 1993, but in 1998, Fr. Jeremiah Fitzpatrick, OCD, Fr. David Costello, OCD, and Sr. Elizabeth of the Mityana Carmel visited Fr. Karooli in a Rest Home in Kampala. He was very feeble and unable to speak. Later, Fr. Stephen and Fr. David visited with him again. The insistent requests of the Nuns in Mityana to our Generalate in Rome to “please send us some friars” did not receive a positive response. The Bishop of Mityana also sent a number of requests to Rome, but to no avail. Then, from November 15 to December 5, 1998, Fr. Jeremiah Fitzpatrick, OCD, one of the General Definitors from Rome, visited our California–Arizona Province. At that time he made known to us that the Superior General, Fr. Camilo Maccise, OCD, wished to initiate a dialogue with the Province about the possibility of founding a Mission in Uganda. The Province and its Provincial took this invitation seriously and engaged the services of a facilitator to assist the Province in its process of discernment. A Uganda Task Force was set up in January of 1999, and the entire Province was invited to participate. It was the chief topic of discussion at the Plenary Council in February of 1999. That same month, Fr. Jeremiah and Fr. David traveled to Uganda to inspect possible sites for a house and to make inquiries. In October of that same year, 1999, our newly elected Provincial, Fr. 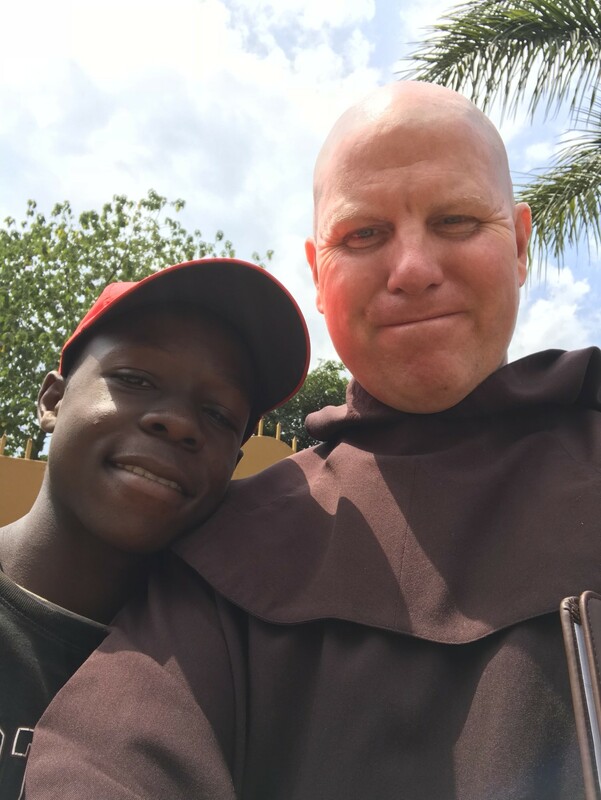 Stephen Watson, traveled to Uganda with Fr. David Costello to inspect the Mission site and to meet with Bishop Joseph Mukwaya of the Kiyinda Mityana Diocese. The result of this meeting was that Fr. Stephen and the Bishop agreed to open the new parish at Kyengeza in August of 2000. Fr. David confirmed that he would definitely be available to go, and the Bishop assured him that he would provide a Diocesan priest to help him become acclimated to the Pastoral situation of the Diocese. Upon his return to California, Fr. Stephen realized that it would not be possible to begin the Mission in August, and he so informed the Bishop, who was very understanding but was also determined to establish the new Mission Parish before the end of the Jubilee Year 2000. This he did, on January 6, 2001, the last day of the Jubilee Year. The Bishop assigned two young Diocesan priests as residents until the Carmelites would arrive. Fr. David arrived at Entebbe Airport with Lillian Kelley, OCDS, on February 8. They were most warmly received. The following day, they were joined by Brother Bernard Olk, OCD, and all three were transported to Mityana and lodged in the Bishop’s House in Mityana--about a 15- to 20-minute drive west of Kyengeza. Bishop Joseph invited the newly arrived missionaries to come with him on his pastoral visit to Kyengeza Parish so that he could formally introduce them to their future parishioners and the resident priests. The Bishop arranged for the missionary team to go to Kasambya Parish, run by the Missionaries of Africa (White Fathers), to become acclimated and to gain local Pastoral experience. Kasambya (located about 80 miles west of Mityana) is considered to be a model parish, and they have a great teacher of the Luganda language. Fr. David and his team stayed there for close to three months. Mission Sunday, October 20, 2002, was a red-letter day at the Parish of St. Kizito, Kyengeza. Bishop Joseph Mukwaya handed over the parish to the Carmelites and installed Fr. David Costello, OCD, as the first Pastor. The Provincial at that time, Fr. Stephen Watson, OCD, concelebrated. After the Mass, papers were signed by the Bishop and by Fr. Stephen.